Your car's windscreen is vital for protecting you and your passengers from the elements, while contributing to your car's structural integrity. More important however, is that a clear, undamaged windscreen helps you see the road ahead along with other road users. If your windscreen is damaged - even just a little - it could impair your ability to see the road. Minor defects can exacerbate glare from sunlight and headlights. If you need to replace your windscreen, it must be fitted properly - or your car's performance and/or air-bag system may be impaired. Chipped windscreen: Is fixing it urgent? In a word, yes. Many badly cracked windscreens started out as a modest chip. It's crucial to get any chips fixed as soon as possible. Don’t be tempted to put off the task. Repairing or replacing a full windscreen is costly - but if you address any chips as soon as you see them, you could well avoid shelling out for a full replacement. It may be tempting to fix chips that are in your line of vision, while ignoring peripheral damage. But wherever a chip is located, it could spread all over the windscreen if left. If a stone is destined to crack your windscreen, there is little you can do about it. However, by driving carefully on roads or tracks where loose gravel lies, you will reduce the chances of any impact. You should replace your windscreen wipers annually, to prevent the build-up of dirt and grime. Regularly examine your windscreen for chips and cracks. Leave a large gap between you and the vehicle in front - particularly if the road surface is covered in stones or gravel. In winter, if you find your windscreen has frozen, do not thaw it out by pouring boiling or hot water on to it. The sudden increase in temperature could crack the glass. A number of DIY repair kits are on the market, designed to address minor windscreen damage. These usually involve injecting epoxy or acrylic adhesive into any crack. However, they are not suitable for moderate or heavy damage. If you're caught driving with a damaged windscreen you could face a motoring offence charge, such as ‘driving a motor vehicle in a dangerous condition’. Your view must be clear and your windscreen well-maintained - according to The Highway Code. If police stop you and believe your windscreen is obscuring your view of the road, you could be handed a three-point fixed penalty on your licence, together with a fine. 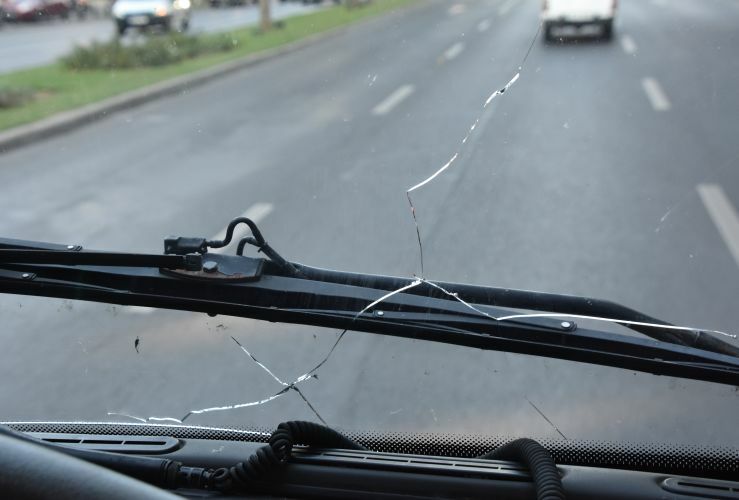 If you have an accident and you were deemed to have a damaged windscreen before any impact, the authorities may charge you with a more serious motoring offence, particularly if anyone is hurt. How does a damaged windscreen affect my MOT? You could fail your next MOT if your windscreen is chipped or cracked. A fail will occur if any damaged area is in excess of 40mm. Before another MOT can take place, any damage will need to be addressed. However, even an area of damage measuring 10mm could mean an MOT fail if it is directly in front of the steering wheel. The official name for this area is windscreen zone A. It is 290mm wide. If you spot any damage to your windscreen, you should have it repaired before taking your car for its MOT. This could save you the time, money and hassle of a second test. Ultimately, even minor damage to your windscreen can result in wider-scale damage which makes it less safe to drive your vehicle - and more costly to repair. Does your car need a spring clean? How much oil does my car take? What causes battery problems in winter? What do I do if my car is juddering? All competitor prices have been based on our most popular 3 star level of cover for a vehicle aged up to 5 years old. Cover includes nationwide recovery, home assistance, alternative transport, overnight accommodation and key assist. Last updated 19/02/2019.